BOSTON -- So the 40-man roster is down to 38, for now. BOSTON — So the 40-man roster is down to 38, for now. The Boston Red Sox did not offer arbitration to relievers Rich Hill and Scott Atchison, and outfielder Ryan Sweeney. Hill and Atchison have bounced between Pawtucket and Boston so it’s conceivable that both could still come to spring training on minor league contracts. But Hill is a left-hander with some success in the past. Someone is going to offer him a major league job. Instead of Hill, the Red Sox offered arbitration to lefty relievers Andrew Miller, Craig Breslow and Franklin Morales (although Morales may get a look as a starter). Others getting offers were relievers Alfredo Aceves, Andrew Bailey and Daniel Bard, catcher Jarrod Saltalamacchia and outfielder Jacoby Ellsbury. The biggest surprise may be Aceves, who seemed to have an emotional meltdown at the end of the season. Maybe the Sox figured Aceves’ problem was with Bobby Valentine, and Valentine is gone. And maybe they believe Aceves won’t mess with John Farrell. When on his game, the versatile Aceves is a valuable addition. Saltalamacchia is someone to watch. He could be valuable trade bait if Boston wants to gamble with a tandem of Ryan Lavarnway and free agent signee David Ross. As for the 40-man roster, there are 15 other pitchers besides the six relievers already mentioned. Four starters: Clay Buchholz, Jon Lester, Felix Doubront and John Lackey. Two returning relievers: Junichi Tazawa and Mark Melancon. And a bunch of guys who will land in Boston or Pawtucket: Pedro Beato, Drake Britton, Chris Carpenter, Rubby De La Rosa, Clayton Mortenson, Stolmy Pimentel, Allen Webster, Alex Wilson and Steven Wright. The two other catchers on the 40-man are Dan Butler (headed to Pawtucket) and Christian Vazquez (Portland). For the infield, we have starters Dustin Pedroia, Will Middlebrooks and, yes, Jose Iglesias. Then there are Pedro Ciriaco, Mauro Gomez and Jerry Sands. The five outfielders on the 40-man include Ellsbury, Ryan Kalish, Daniel Nava, Alex Hassan and newly-signed Jonny Gomes. Finally, the Red Sox have the Big Papi himself, David Ortiz, as designated hitter. That leaves two openings, and the Red Sox need at least another starting pitcher, an outfielder and a first baseman. Of course, trades and designations for assignment can make more room. 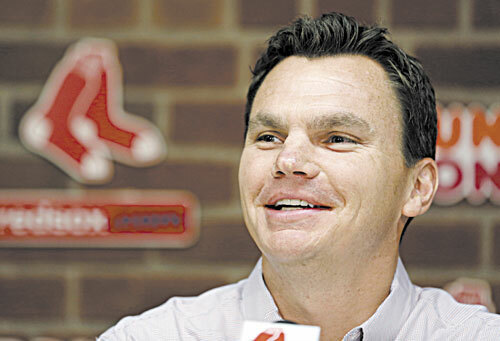 General manager Ben Cherington still has some work to do, moves to make. Some of those moves may take place this week at the annual winter meetings in Nashville, starting today. On the final day of the meetings, Thursday, the Rule V draft will be held. Boston can be expected to lose at least one player (likely reliever Josh Fields). Others who could be drafted include outfielder Jeremy Hazelbaker and relievers Brock Huntzinger and Chris Balcom-Miller. Boston has already watched a group of minor leaguers leave through free agency, including three former Sea Dogs who signed minor league contracts elsewhere — pitcher Caleb Clay and infielders Marquez Smith and Nate Spears. Clay, 24, was a sandwich-round draft pick out of high school by the Red Sox in 2006 (signing bonus of $775,000). He had Tommy John surgery in 2007 and never seemed to pitch consistently well. He spent the last two years in Portland’s bullpen, recording a 4.61 ERA last year. Clay signed with the Nationals. Smith, 27, was signed out of the independent leagues last June and batted .293 in Portland while playing a fine third base. He signed with the Reds. Spears, 27, signed with Boston as a minor league free agent and was assigned to Portland in 2010. He shined and moved up, playing mostly in Pawtucket the past two seasons, with short call-ups to Boston each year. Former manager Terry Francona always spoke highly of him. Not surprisingly, Spears signed with the Indians, whose new manager is Francona. Notes: Former Sea Dogs infielder Yamaico Navarro has been traded from Pittsburgh to Baltimore … Boston’s minor league roving hitting instructor, the popular Victor Rodriguez, has been named to the new position of assistant hitting coach in Boston.